"Which one of us would bid this game to end? We are nearly perfectly matched, but there can be only one victor." While the Imperial city of Otosan Uchi continues to flourish, the Emerald Empire around it is begins to show cracks. The Lion and Crane sit on the brink of all-out war. Some believe the death of the Emerald Champion Doji Satsume to be more than an accident. The Dragon Clan Champion, Togashi Yokuni, is troubled by apocalyptic visions. And above it all, the Scorpion look to take advantage of this chaos and forward their own agenda. 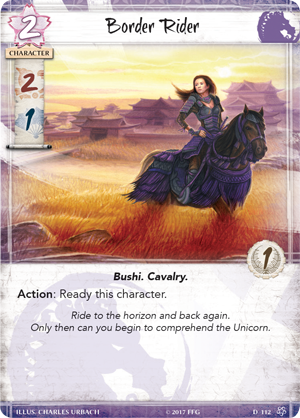 Join us today as we preview Into the Forbidden City, the third Dynasty Pack in the Imperial Cycle for Legend of the Five Rings: The Card Game. 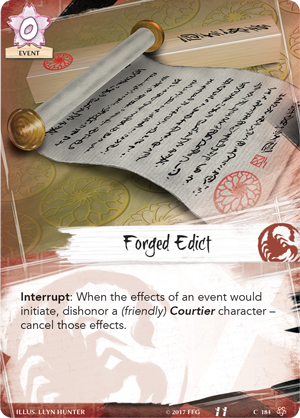 Into the Forbidden City features three copies of twenty new cards and continues the trend of giving each Clan a powerful new five-cost character, and introducing an assortment of new cards with the Imperial trait. In the Emperor’s Court, no intrigue escapes the attention of Bayushi Kachiko (Into the Forbidden City, 56). She sees and hears everything that occurs. Her spies are the highest paid in the Empire, and every secret that passes through every gossip’s lips eventually makes its way to her ear. It is rumored she holds enough evidence to blackmail every family in the Empire. Whether the rumor is true or an invention of her own is not known, but no family is willing to test it. And that may be her greatest strength. Bayushi Kachicko stands behind the scenes, manipulating means to an end. This makes her the perfect character for the Scorpion Clan to bring into their political conflicts. While Kachiko is participating in a political conflict, as an Action, you may choose a participating character with lower political skill, send that character home, and bow it. 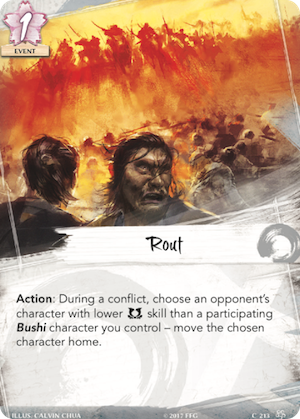 Not only does this remove the character from the current conflict, but nearly ensures they will be a non-factor in conflicts for the rest of the turn. Even if they have some way to ready, Kachiko has still eliminated them from the conflict at hand. 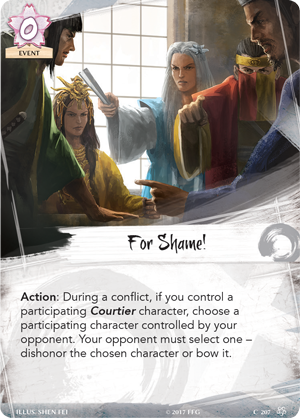 As a Courtier, Kachiko is also a valid target to pay the cost of Forged Edict (Core Set, 184), or use a tactic like For Shame! (Core Set, 207). Any wise opponent will think twice about entering the courts when Bayushi Kachiko is on your side. 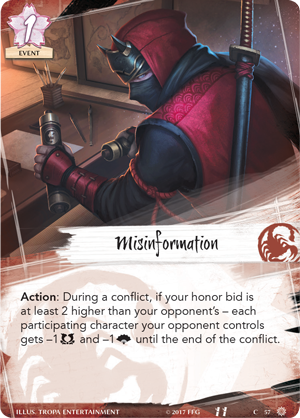 One of the Scorpion’s most valuable weapons in their machinations is Misinformation (Into the Forbidden City, 57), an event that subtly undermines their opponents in military and political conflicts alike. 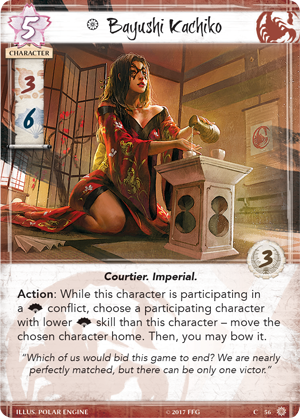 During a conflict, if your honor bid is at least two higher than your opponent’s, each participating character your opponent controls suffers from reduced political and military skill until the end of the conflict. If you're up against the Lion Clan, Misinformation can be a huge advantage if they try to overwhelm you with sheer numbers. The more characters your opponent commits to a conflict, the more effective Misinformation becomes. While the Scorpion continue to master the art of deception, the Phoenix continue their journey into the mystic arts. 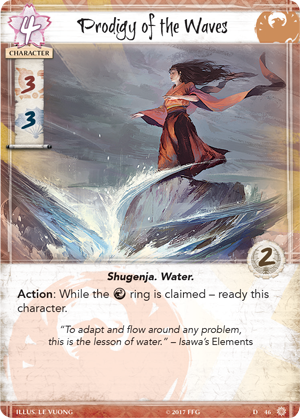 By studying the elements, their Shugenja form a relationship with fire, water, earth, air and the void to defeat your enemies with powerful spells. 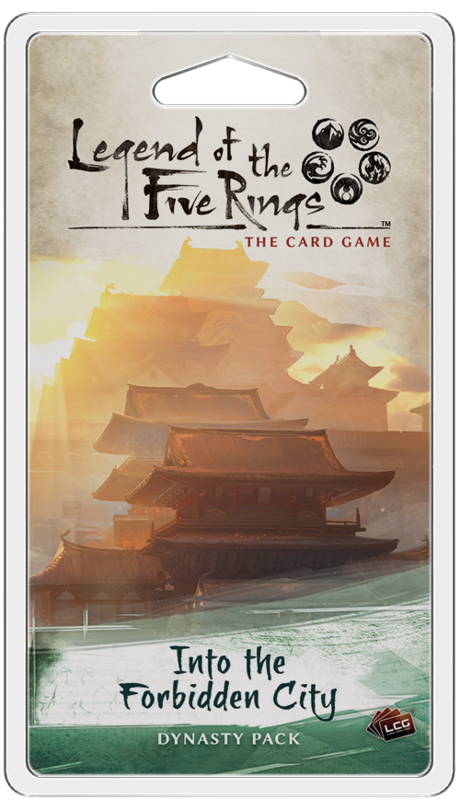 The Prodigy of the Waves (Into the Forbidden City, 46) has a unique connection to the water ring—as long as it is claimed, you may ready the Prodigy as an Action. It's important to note that you don’t have to be the one who claimed the ring. So long as either player has claimed the water ring, the Prodigy can be readied. 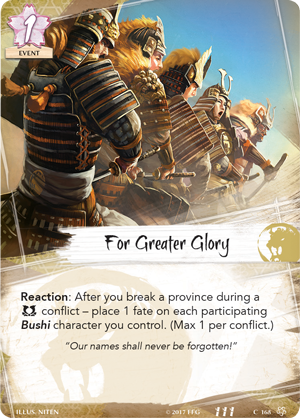 With starting military and political skill of three, the Shugenja is perfect for participating in any kind of conflict, preferably multiple times a turn. The Unicorn wage war in odd ways, even using animals in their military conflicts. Many are wise to run when the War Dog Master (Into the Forbidden City, 49) enters the battlefield. Not one for political discourse, the War Dog Master can exclusively be used in military conflicts. 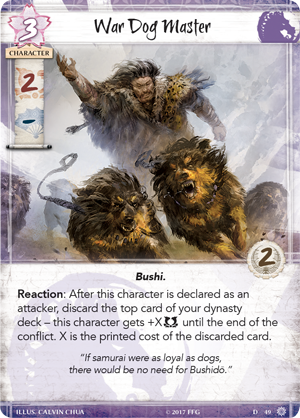 Whenever the War Dog Master is declared as an attacker, you discard the top card of your Dynasty deck. Then, the War Dog Master gets plus X military skill until the end of the conflict, where X equals the cost of the discarded card. While this ability is inconsistent, so long as you don’t discard a holding, you are guaranteed to receive some sort of skill boost. You may discard a Border Rider (Core Set, 112) for a smaller boost, or a copy of Shinjo Altansarnai (Core Set, 121), giving the War Dog Master a massive five additional military skill. Either way, the War Dog Master is a character anyone would want in a military conflict. 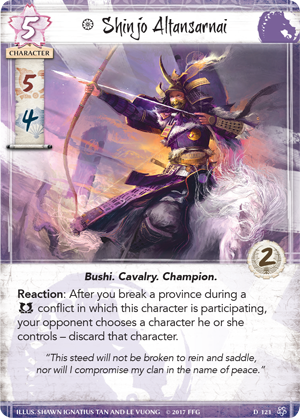 As a Bushi, the War Dog Master is also a valuable target for cards like Rout (Core Set, 213) and For Greater Glory (Core Set, 168), giving him additional value, especially when supported by the Lion Clan. What fate awaits Rokugan? As divisions begin to pile up between the Great Clans, who will be left to see the greater picture? More importantly, what side will you choose? 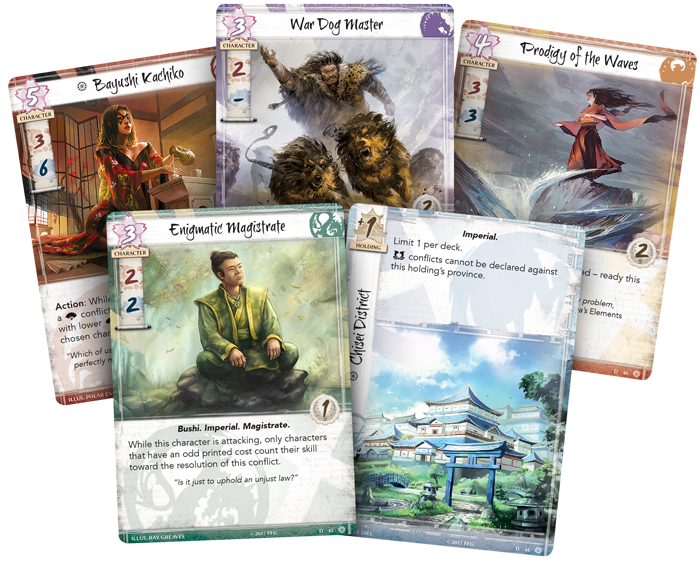 Stock up on supplies and pre-order Into the Forbidden City (L5C04) from your local retailer or from our website here.